OK, I have another pumpkin recipe for you guys! I just can’t get enough this Fall. 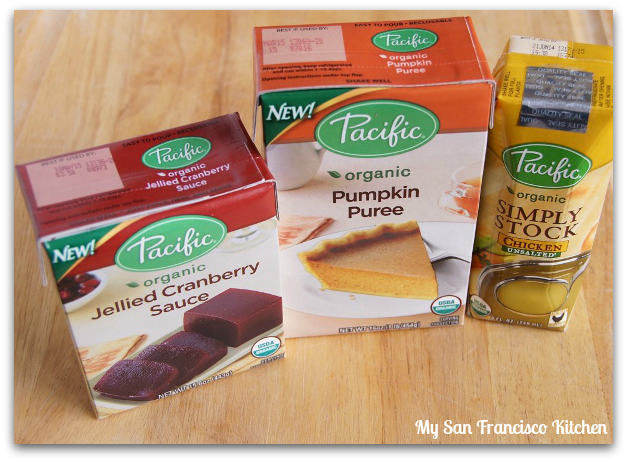 This holiday season, Tetra Pak and Pacific Foods sent me a few items to sample in environment-friendly packaging: pumpkin puree, jellied cranberry sauce, and chicken stock. 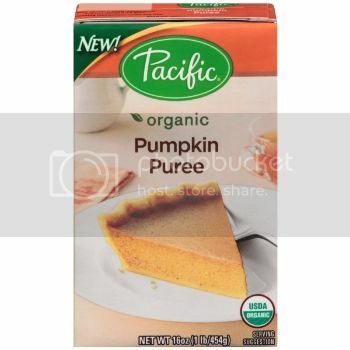 Now, you all know how much I am loving pumpkin recipes this fall, so I decided to try out the pumpkin puree first! I made some delicious pumpkin french toast, which was just the perfect thing to warm me up on a chilly morning. The pumpkin french toast recipe is very simple – no baking required! Enjoy :)! 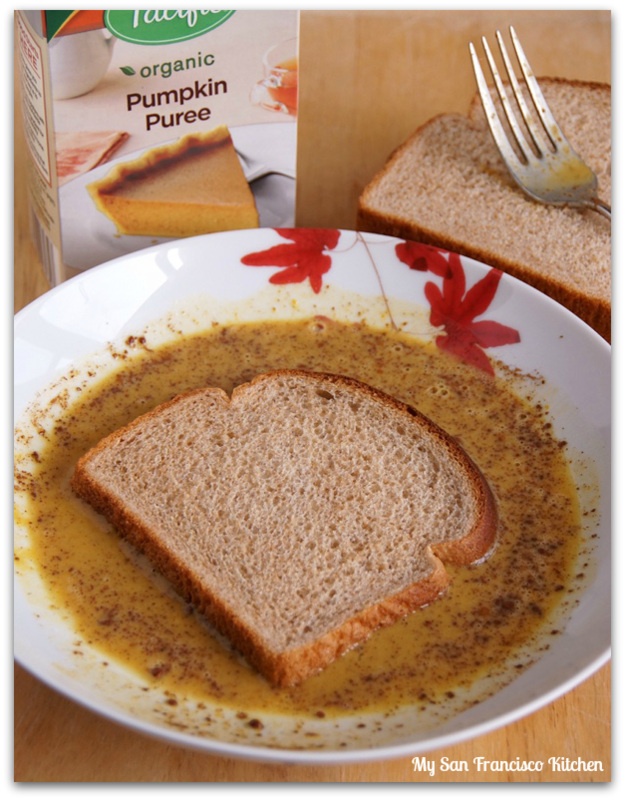 Whip up eggs, milk, cinnamon, sugar and pumpkin puree, then soak each slice of bread before cooking on a heated skillet. 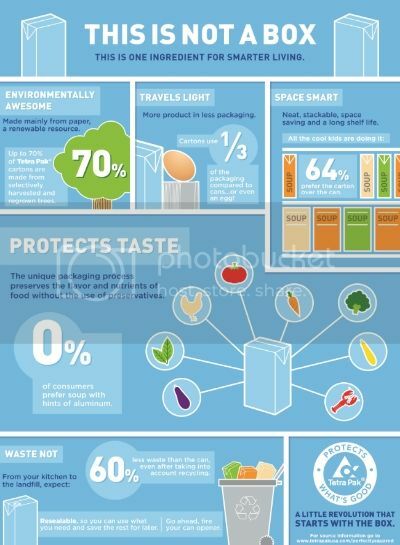 • Cartons use 1/3 of the packaging compared to cans…or even an egg! • Cartons are space saving, easy to store and open. Keep your pantry neat and toss your can openers. , stackable and space saving. 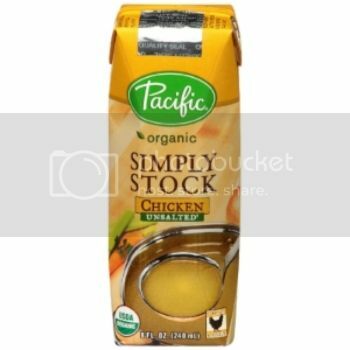 • The unique packaging process preserves the flavor and nutrients of food without the use of preservatives.Product quality is exactly the way it was intended to be. Beat the egg, cinnamon, sugar, pumpkin puree and milk together in a shallow bowl. Dip both sides of the bread slices in the batter, gently shaking out excess batter back into the bowl. Cook each side of the toast on the skillet until golden brown, about 2-3 minutes per side. This entry was posted in Breakfast, Thanksgiving and tagged bread, pumpkin. i will be making this for the weekend. simply divine. 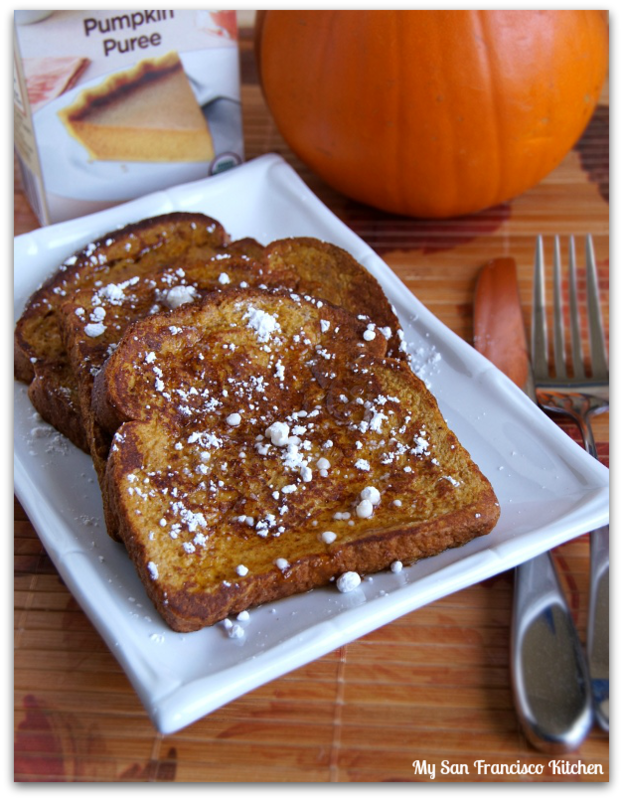 Love the idea of pumpkin French Toast – not something I’ve made before. Love the idea of this way of packaging things, too. Thanks for putting it on my radar screen. Sounds like a great twist on French toast! Yum, such a creative way to serve french toast! That is a beautiful and yum look toast. Can’t wait to try out some of the products. 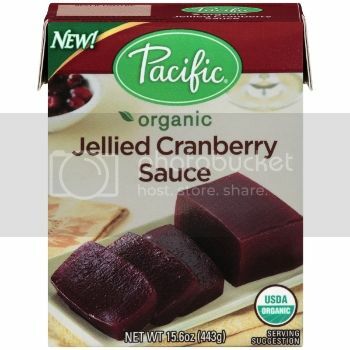 Perfect breakfast for Thanksgiving weekend!